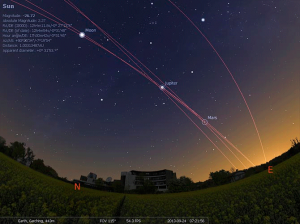 Stellarium is a space planetarium software for Mac. The program shows a realistic sky in 3D, just like what you see with the naked eye, binoculars, or a telescope. The program is being used in planetarium view. You could set your favorite coordinates and see. System requirements: The program requires OS X 10.10 or later.